We are pleased to offer a classic two-mast sailing boat based on the design of an 18th century North Atlantic schooner allowing you to experience oceanic adventures of days gone by. Both the exterior and the interior represent a harmonious fusion of eclectic Asian and classic European craftsmanship in an effortless fusion of ultra modern style and old world charm. 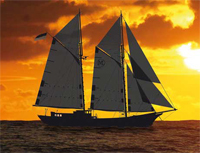 The schooner is complete with all high end amenities offering a true luxury sailing boat experience. This luxury sailing yacht is available for private charters to the most remote islands of Indonesia, has a crew of 13 and can comfortably accommodate up to 14 guests. 6 state rooms, 1 master state room, restaurant, lounge, large sundeck, outdoor dinning, library, audio/video, Internet and Satellite phone, dive & water sport facilities, tenders, languages English, Dutch, German. Transfer from the hotel to the boat and back to the airport or hotel.The exclusive use of the sailing boat and all water sport facilities. All meals as specified on the itinerary, including soft drinks and beer. All offered land excursions.All admissions/government fees, permit and national park fees. Western Trip Leader and multilingual guides on board. Facilities available for meetings, seminars and business on board. including: a conference room on board with table and seating for 25 people. Conference facilities on deck for larger groups; conference equipment such as white board, projector, television for presentations, internet access, satellite telephone and general office inventory as required. Catering possible for special conferencing requirements such as: team building activities like hiking, diving, sailing, water sports, and other activities; provision of security for high level meetings can be arranged through the boat management companies security agent based in the UK. In Bali everything is close by. 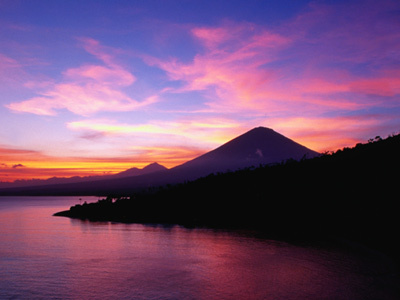 Luxury cruise Itineraries offered throughout the year, the exclusive cruise expeditions vary from visits to the Komodo Dragons, a cultural experience with the Asmat Warrior Tribes in Papua, a trip to the Spice Islands in Banda, a gypsy village in Wakatobi or just experiencing the best diving in the world on the untouched coral reefs around the various islands of Indonesia.